Children live in a world of "No's." No, you can't play with slime through the house. No, you can't lay upside down at the dinner table. NO, you can't do THAT either. As children are growing up to learn acceptable behavior, follow rules, and go with procedures, art class is the great release for children as they can hear the invigorating and satisfying word "YES." During our Creative Geniuses art classes we do have a list of things to be learned and goals to reach, but art class is different than many other places of learning. In art class, our students have a goal to meet which is the art project and it's objectives. As we are reaching those goals our students find many paths to get to the destination (which is the complete project). We surprisingly hear so many questions asked for lots of little details such as: "Can I use a brown crayon? Can I smoosh the clay? Am I in trouble because I got a mark on my finger by accident....." The relief on the student's faces when we give them a comforting "It's okay," is absolutely memorable and heartwarming. As art teachers it's our normal to say "Everything is going to be OK", but we are reminded of where the students are coming from when we hear so much fear and hesitation when we first ask them to create. It reminds us that these children are not often set free from the routines of daily life. We are so thankful these future leaders and innovators have art class to let their true light shine! "Decision making is one of the most important skills your children need to develop to become healthy and mature adults." - Jim Taylor, Ph.D. "Parenting: Decision Making." Psychology Today. 2009. This working space demonstrates that a variety of seating arrangements helps students to be motivated, focused, and grow their art skills. Students that make their own safe choices and decisions get a chance to learn cause & effect, the rewards of perseverance, and can grow their confidence. 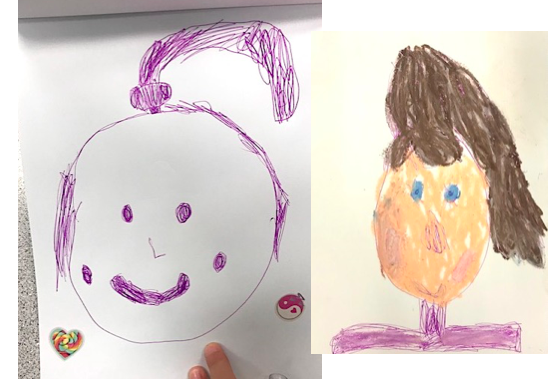 Two students, both Kindergartener, drew portraits of their best friend. One student liked hard lines, and the other preferred smudging and smearing color. Each student was able to pick a drawing media that worked for their preference. Both students are learning about shape and facial proportions, but in their own unique way. Question: What is one thing you say "No" to that maybe if you said, "Yes" to wouldn't be so bad after all? What would be the benefits? Feel free to comment below. What if we told you we transformed a child's play environment into the most glorious magnificent playroom with a little brown paper, a few sticks, a couple pebbles, and some brown mud? With the right direction and a little imagination, it was possible. Read on to see what we did! Our art project was Cave Wall Art. We began imagining a time machine travel experience WAY BACK into time. Rocketing through space and light, buttons on our machine beeping and flickering. We land with a BOOM and open the door. Low and behold we are deep inside a musty dark cave. We meet a nice cave family in front of a warm fire. They do not look like us, speak our language, or have a written language. HOW ON EARTH CAN WE COMMUNICATE? Answer: Pictures. Pictures and art is a language for EVERYONE. With our cave art activity we began imagining then literally turned our art rooms into caves using brown paper. There were lots of places to explore including bumpy rock walls, and inside dimly lit caverns. Students used natural art materials including twigs (charcoal vine sticks), pebbles/rocks (neural colored chalks), and dirt/mud (brown paints). We practiced art techniques with our tools including smearing, smudging, outlining, and printing to create symbols. We wanted to communicate a story through symbols to the cave people about our world in 2017. We learned we had some similarities with the old cave symbols such as the importance of animals and family. We also shared some new symbols to them such as the hashtag and the game of tic-tac-toe. We showed them a map to our place, and they began to understand us a little more. Students found a lot of joy doing this activity as they got to imagine with a heightened environment. 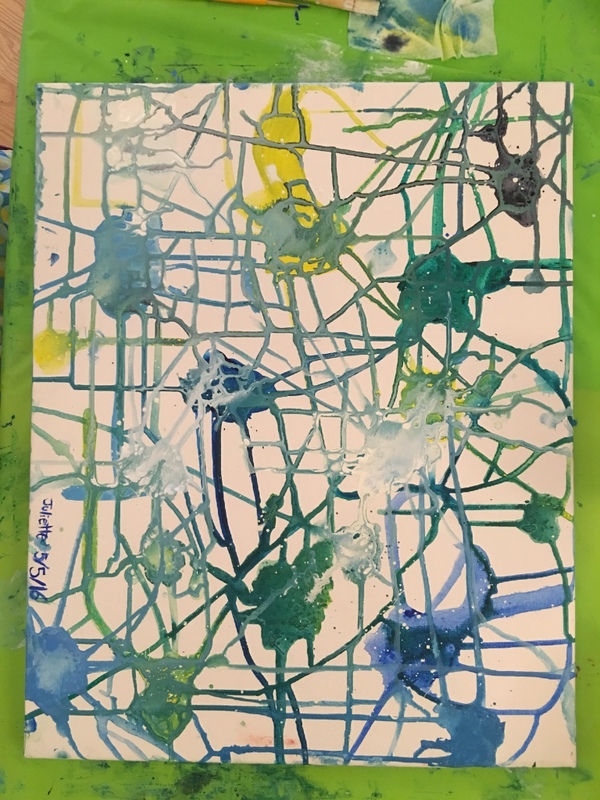 On our adventure we explored the past, met new friends, worked with new art materials, and released urges that kids don't normally get to do at home (write and paint on the wall and dunk their hands in paint!). We told our students to hold onto that excitement and keep an eye out for more symbols of our modern age when they leave the classroom. We know they will report back with some great findings! Ask your child to think of all the places they find meaningful symbols throughout their day. What do these symbols communicate? Feel free to comment below with ideas on this topic! Our students are blasting off this season with our Fall art program "Once Upon a Paint Drop..." which centers our art making around the big idea of storytelling. This past week Art Squad (ages 5-11) has been working on a project about our BFF's. We start by thinking of the fun times with our BFF and what qualities makes them a special friend. The inspiration leads us to sketching and skill building in portraiture as we honor our BFF with a drawn portrait. It's amazing what one single lesson in our art program can do to help build excitement and skill build. We have put together a student gallery below to show the accomplishments our students have made during one class. Many pictures show examples of "before" and "after" practicing. Class time helps to slow down and be mindful of what we are making. Every student works at their own pace, so some kids are still working on drawing, and some have moved onto color mixing. Pictures of the process and progress are so amazing. See below! As our students leave class, we want to empower them to be creative in their lives at home. Students are encouraged to interview their BFF to find out a few new things they never knew before. This information, along with their portraits will be transformed into a news article headlining their BFF. We hope this project brings friends closer together, builds excitement to create art, and encourages children to communicate and build their love for writing. Comment below to help grow our topic: In a culture of selfies and screen staring, how can we help our young people strengthen human connections and honor others? "This is my friend wearing my jacket. Friends Share." While technology can't be ignored and has it's benefits, it is also important to find ways to save real human interactions and real viewing of the world around you. Did anybody miss something cool out the window on the road trip this summer because instead of gazing out the window they were hunched over working on that screen? We all love our screens, but really, it's all about balance and not forgetting to take in the tangible world around us. We also need to mention the great satisfaction of using our hands to create stuff. Kids like their iPads, but they LOVE hands on experiences. (Hence the slime phenomenon! They love holding, playing with, and feeling that stuff!) Adults too; think about one time when you got that satisfied fulfillment using your hands to make something....it could've been something as simple as making pizza dough, but it was a satisfying feeling, right!? Creative Geniuses Fall Sketchbook is the answer to creating this balance. Our student sketchbooks are the program's custom supplement that will give our students the satisfaction of the hands on experience they crave while incorporating technology that they desire. See how our students are using their sketchbooks by viewing the gallery on our Facebook Page. Don't forget to share your Creative Geniuses Sketchbook example or see other artist examples by using #WeAreCreativeGeniuses on our Instagram! We have to do more than tap our fingertips! We need to engage our whole hand....along with our heart and mind. This will lead us to our most colorful life. Save 15% on sketchbooks this week only during our presale! Use the promo code PRESALE15 @ checkout to get the deal! Summer inspiration included: Sunlight, nature hikes, chalk, sand, bubbles, hot air balloons, popsicles, & ice cream. Our students shined bright this summer as we visited the big idea "Fun in the Sun." Some student artwork obviously carried this theme and others contained the idea more abstractly as art sometimes makes you think deeply. Either way, every student made artwork that was personally meaningful while learning to bring ideas to life. Take a look at our photo gallery below to see the fun we had and the cool things we made. Some of our projects included: photography using sun rays, shadow studies in chalk, sun catchers, collaborative sand box play, bubble painting, pop art summer treats, and hot air balloon innovation. Summer is inspiring in so many ways. Our spring program was titled "Art Moves Us." Spring weather was beautiful and students got up and moved quite a bit during the learning process. 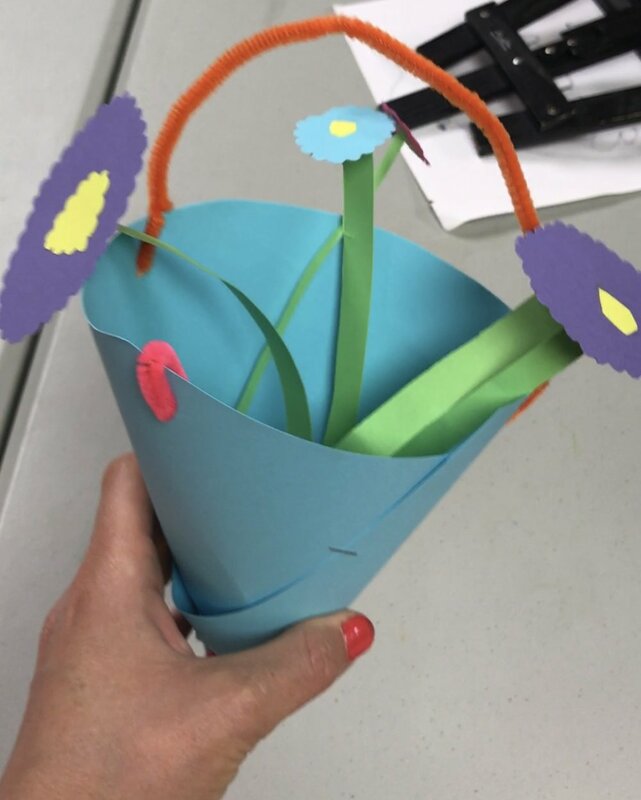 Some of our activities included: delivering handmade paper flower bouquets to special people for May Day, dancing, hiking to the park, and surveying buildings to build scavenger hunt maps. We moved and we made art connecting to the idea of movement. Here are some of the artwork we made. We started with our feet studying and drawing our shoes. We painted from life while enjoying a beautiful day at the park. We designed our own 3D sculptures of playgrounds that would promote children to move. We made bobbleheads that really bounced and carriers to cart around our favorite toys. It was all a lot of fun. Please take a look at and enjoy our spring student gallery. Stop dripping, no making a mess, and don't play around. A friend of mine once told me that not every art piece brought home will be a perfect masterpiece. This is true. Some art pieces do go in frames to be cherished forever, some go on the fridge for a few weeks, and then there's art that gets recycled or thrown away. Throwing one piece away does not dispose of the value of the art class or the child's experience. There is much more value to a piece of artwork than what you initially see as your child shows you what they made during class. And maybe it's looks a big mess or a bunch of nothing! I promise you it's definitely not nothing. Real true artists over time have made what seems like big messes and/or big nothings. This is an opportunity to talk with the students, get the brain gears moving, and engage in communication. Thinking, "It looks weird, but what does it all mean? How did the artist make that? Why do you think he splattered that paint all over?" See, gets you thinking. Children will tell you about their pencil slashes across the paper and their paint drips. It could be the child dropped the brush learning to grasp it, or it could be a dinosaur roaring! Go ahead and say, "Tell me about this mark!" That crazy paper may get thrown out, but the conversation with your little one will be treasured. Not every art piece is a masterpiece, but it IS a magnificent process for the children and experience that is not seen but felt in the student's heart. During class we are in a process of play, learning, and experimenting. What you will see during our art classes is kids being given the time to be kids. To be their creative selves. They live in a world of rules and ways to do things, at home and at school. I bet at school they line up everyday in a straight line. Well, maybe it would be fun to be in a curvy line sometime? We can do that and make it work if it's a request. The creativity is discovering the possibilities of a line whether it's straight, curved, or zig zag! At art class, they deserve this opportunity for 30 minutes or an hour to take safe risks. We are here to enjoy this present moment and just be. It's okay if every piece is not going in a future art show to win a prize. It's ok if it doesn't make it to the fridge but gets recycled. Also, remember in our rooms we have a scale of maturity levels and kids are all learning at their own pace. Maybe they are not ready yet to sit for 10 minutes. Then they can stand and make their art then, it's ok. We've heard a lot lately of "OH NO! DON'T DO THAT!" as parents jump in from the sidelines. Some parents come in and make the children do it over how they think the teacher wants it to look. It's okay if the child wants to put their name in the left corner instead of the right corner of their work. It's okay if they feel the paintbrush because they are intrigued. We stay calm as long as everything is safe, respectful, and there's no major earthquakes. Parents and caregivers, give them this moment to experience this. We are not total chaos in the art class either. We recognize kids need a balance of routines, rules, and some creative time. This time in art is balanced. It is both full of excitement and peace. Our art classes are meant to be nicely balanced and a happy time. Yes, we will have some masterpieces and some messes. We will react and respond with positive attitudes. It's all wonderful. We just take a few deep breathes and enjoy their smiles and wonder. The kids smiling is really what it's all about. Maybe smile ourselves as adults need to do more of that! Thank You! Let me know you love me. With a hug. true. Share my tears when they don’t. Let me run…..let me laugh…..let me play. Warmer weather brings playing at the park. Students are currently working on engineering their own freestanding parks through paper sculpting. Preparation included: sketching and discussing memories of their most favorite parks, envisioning the greatest parks, the many types of parks, designing, variations of line, building materials, and safety! Lots to plan and talk about in considering this build! Students were also encouraged to name their parks and considered how many park names honor special people. This past week students of all ages, levels, and abilities learned about the holiday of "Pysansky" and the tradition of Ukrainian Easter eggs. They connected and discussed similarities and differences in this cultural art to their own lives. Students practiced design balance and also played with wax resist techniques to create watercolor paintings. Every student shined in a different part of the process; some in the practicing part and some in the final touches they went above and beyond. This project was very individualized to each student and their work is each very beautiful and unique! One ambitious student went above and beyond by placing his egg on a golden pedestal within his own museum. It's priced at $1,000! Note his yellow clearance tag ha ha. Click on the images to view larger. PreK Art Play students made textured flowers from painting with sticks and forks. A little like Van Gogh. Sketchbook Club kids wanted to learn about drawing plants and flowers so we worked on drawing from life and added extra fancy vases from our imagination. Students worked in their sketchbooks designing text and drawings that communicated a positive message. We talked about graphic design, logos, fashion, and many other related topics. These artworks were then transferred onto a t-shirt for students to wear as a walking art display intended to spread happiness. Last Thursday, December 15, 2016, nearly one hundred friends, family, and community members of Granger came together to participate in the Creative Geniuses Student Art Show. There was an art display, treats, and an art project that families enjoyed together building a snowman family portrait for their home. This Fall, students enjoyed art classes making sculptures, paintings, and drawings of many things including: self portraits, architecture, cartoons, and dolls and toys. Students took a lot of pride in the display and great conversation was heard as the children told their loved ones about their artwork and the processes they went through to make it. The town of Granger has wonderful brilliant children with amazing families. Thank you to the supportive family and friends that came out in the blustery winter cold to support the children and the arts. It is this support system that makes the city of Granger and it's people so amazing. Many of our students are submitting to Grimes Parks and Rec Pumpkin Decorating Contest. Use a theme to decorate or come up with your own creative ideas. This is a great opportunity for students to showcase their art and have it seen by the community. Click here for details on how to submit! It's easy! Creative Geniuses students celebrated Friday evening as they exhibited their artwork in a spring art reception and show. Students enjoyed showing friends and family their display and enjoying a family art making stattion. Artwork included an eclectic display of drawings, paintings, and sculpture celebrating the season of Spring. Classes included PreK, elementary aged, and adult students. Reception for the Mother Nature Art Show was held on Monday, May 23, 2016. Founder and art educator Gina Bartlett joined three other artists in the show: Grace Schmidt, Kathryn Bartels, and Carrie Minteer. The show brought a large crowd in Monday evening for it's opening reception. Visitors and artists alike came in from multiple states across the midwest to view the show. It was a great time. These artists have over thirty works of art on display to celebrate motherhood and honor the beauty in nature. A children's art making station is also available in this show for children to add to the gallery. The works are on display from now until mid June at the Hanover Park Community Center in Hanover Park, Illinois. Check it out and support the arts by viewing and purchasing original one of a kind artworks for your home or business. Thank You to all the Creative Geniuses that made artwork for display at the South Side Des Moines Public Library. "Thankful For Des Moines" was a beautiful art show for the community to enjoy! Creative Geniuses hosted a special holiday art event this Tuesday for the students at Christ the King School in Des Moines. Students enjoyed making a variety of arts and crafts, some of which would be presents for teachers, parents, and friends. All the gifts that left this art studio were handmade, original, and unique! The students were delighted with special guest, children's book author, Laura Jensen Kimball. Laura read her latest book, "Momster." She spent time talking to the students about her book and answering curious questions the kids had for a real life author. The students were very inquisitive asking about many aspects of the book including, "what is it made out of?" This Saturday! Art for kids and shopping for the parents! Saturday, November 7, 2015 from 10-3 p.m.
Creative Geniuses will be hosting a FREE community art project for children at the Jefferson Community Fair. Parents can enjoy shopping while kids participate in an art piece that will be on public display at the South Side Des Moines Library. Drop in anytime from 10-3. No registration required.